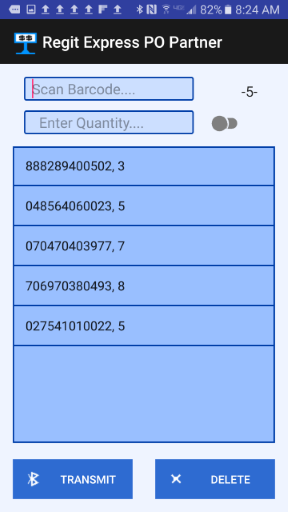 Regit Express EZInventory for Android Devices updates your inventory by adding to, subtracting from, or replacing the inventory quantities. You simply scan the items and transfer the list of items by way of Bluetooth or your charging cable. Then use the Regit Express utility program to read the file and update the inventory quantities. EZInventory is also designed to work directly with the Regit Express Plus Stocktake Module. The Regit Express Remote Application provides pre-scanning merchandise to prevent or alleviate congestion at a busy register. One employee can be scanning items while another can be quickly checking out customers. Scanned merchandise is sent to the register by way of Bluetooth. The function works totally in the background and does not disturb the cashier's operation. When ready, the cashier simply pulls up a transferred file which automatically populates the transaction with the scanned items. The cashier is then free to make any adjustments to the transaction prior to tendering. Regit Express PO Partner for Android Devices creates or updates your purchase orders by supplying or adding to the purchase order quantities. You simply scan the items you want to order, then transfer the list of items by way of Bluetooth or your charging cable. 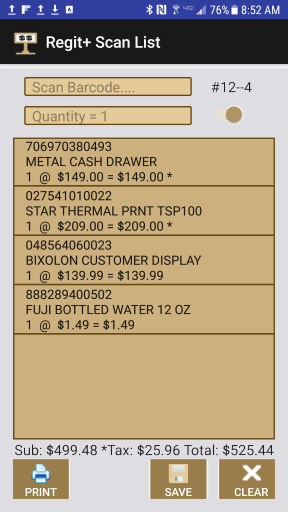 Then use the Regit Express Plus's Purchase Order Module to create or update your purchases. The Regit Express Scan List for Android Devices prints a bar code list for customers to present to the cashier during checkout. The list is useful wherever side type sales are taking place. Examples include meat counters, yardage stations, deli or other fast food areas, bakery items, lumber yards, classroom settings, prescription drug counters, film development counters, or anywhere bulk items are sold. The cashier simply scans the items on the list during checkout. Each register is equipped with a Bluetooth print listener so they can print out a scan list. Additionally, standalone print listeners are available for downloading on our web site. This allows scan lists to be printed anywhere and from as many locations as needed. 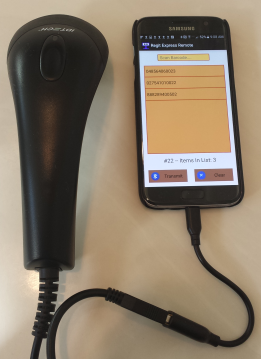 The Regit Express Scan List for Android Devices provides remote access to product information. 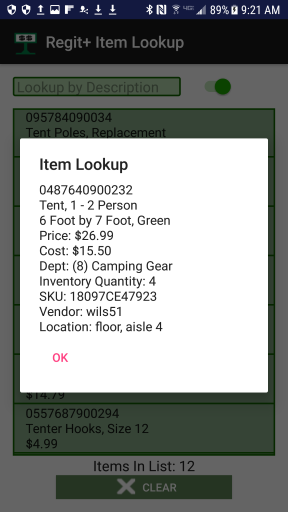 The database of inventory items is created from the Regit Express Office and then transferred to the Android device. 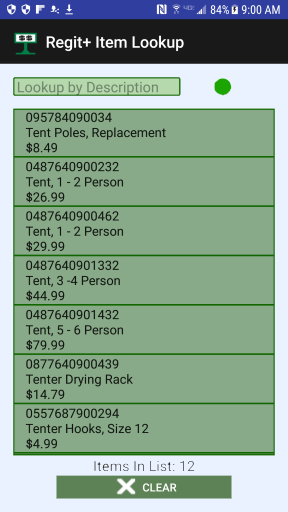 Inventory items can then be easily looked up by entering a partial description or product code for the item. While these Applications will undoubtedly work with many or most Android devices, it will equally not work with some. So, please do not go out and purchase a new device for use with the Regit Express Remote App that we have not tested or have received working reports from users. You can download and install with most Android devices directly from this download. However, some Android versions will not allow direct installing when the .apk was not from the Google Play Store. If you do not know how to install an Android App (.apk installation file) that is not from Google Play Store, refer to the Instruction Manual for those instructions. 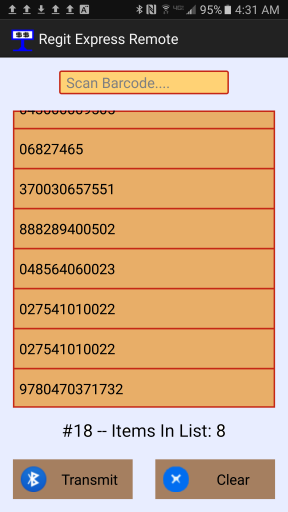 We are starting a list of Android devices that we have tested and devices other users have reported working. If you have tested a device please report that information to us so we can add it to our lists. You can report results here. *Apparently the Galaxy Tab 3 does not have external keyboard functionality. **Kindles/Fires works either in full soft keyboard mode or bar code mode, but not both like most android devices. Once a scanner is connected, the softkey input no longer functions. However, this is not necessarily a bad thing as using a "30 number sheet" to scan quantities in is much more efficient than stopping to enter quantities via the soft keyboard. The Good, the Bad, and the Ugly -- Our Bluetooth Adapter Story. A good Bluetooth adapter can save you loads of time transferring files, while a poor adapter can make your life miserable. When we first started working with Bluetooth devices we purchased three cheap Bluetooth USB adapters (dongles) for about $6 each. Our first experiences transferring files with Bluetooth was very problematic. Constant repairing, failed transfers, and confused adapters were making us reconsider Bluetooth as a viable file transfer alternative. We then noticed that our Android devices had no problems transferring files between themselves, it was just the PC's that were having the problems. We immediately suspected our cheap dongles and purchased a PCI Bluetooth card to try. We never got the card working at all on either Windows 7 or Windows 10. We tossed the card in the trash. We scoured the web for reviews looking for a quality Bluetooth device. We couldn't really find any reliable information on what was a quality device and what was not. So we gave up and purchased another, more expensive USB adapter. Problem was solved, the new dongle worked perfectly. We don't want to mention any brand names here. But if you are interested in the USB adapter (dongle) that finally solved our problems, send us an email and we will get back to you with the brand/model we are using. We paid $13.99 on Amazon. Version 1.0 would not allow having both the EZInventory App and the Scan List App on the same device. This version corrects that. You will need to manually uninstall the previous Scan List App or version 1.0 will remain on the device (Settings, Apps, Application Manager, Regit+ Scan List, Uninstall). 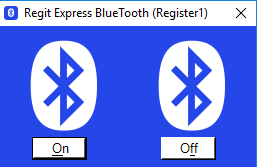 --Added a "Save" button to the program so users who do not have Bluetooth, or want to manage the transfer of the files (called sharing in Android) by other means may do so. 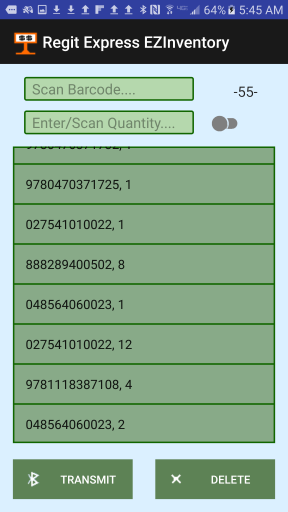 --Improved the soft key input capabilities for non Bar Code use. Fixed an issue with Bluetooth not working on devices that received upgrades to Android 7 (Nougat). Added a feature to automatically save and restore ongoing data when user leaves, quits, or goes to another App.